So you’re ready to start learning guitar (or maybe it’s your kid or another family member). Now you’ve got to buy one, and you have no idea what to look for. Fear not! This guide will help you find exactly what you need. It excites you! If your guitar compels you to point at it from across the room every time you see it and yell, “That’s so freakin’ sweeeeet!” then it will be easy to pick it up and play every day. It doesn’t hold you back. If your guitar is abnormally difficult to play, then it’s holding you back, making practice more of a chore than a pleasure. 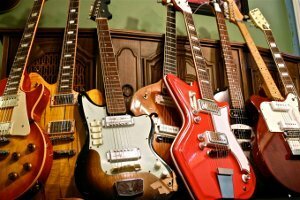 This is common with old “Grandpa’s attic” used guitars and with ultra-cheap mass-produced guitars. Also, watch out for electric guitars and amps with a thousand twiddly knobs and switches. Geeks like me find that intriguing and want to see what they all do, while others get overwhelmed and frustrated. It’s not too expensive. You’re the ultimate judge on this one. You don’t want a huge sunk cost if you don’t end up sticking with the guitar, but make sure you balance this with points 1 and 2. The cheapest guitar you can find might not excite you, and it might hold you back, sinking that cost before you even get to “Smoke on the Water.” Expect to spend between $150 and $500 for a quality starter guitar that you can fully appreciate. Should You Buy Acoustic or Electric? Acoustic guitars are at least occasionally heard in almost every genre of music, but most commonly in folk, bluegrass, country, singer-songwriter, flamenco, and classical. Beyond stylistic concerns, the acoustic’s greatest advantage over the electric is portability. You don’t need any extra gear in order to make music, so you can strum it on your porch or take it camping. There are two primary types of acoustic guitar: steel-string and nylon-string. (It’s not just the strings that are different; each type of guitar is built with the strings in mind.) Steel-string guitars are more popular, and if your goals resemble strumming along with your favorite songs or singing and playing at the same time, then this is probably what you want. Almost all acoustic guitars you hear in pop, rock, country, bluegrass, or folk are steel-string. For low-end steel-string acoustic guitars, I’ve been consistently impressed with Yamahas. I own one myself, and I love it. My current recommendation is the FG700S. For kids under 10, go with a 3/4-size guitar like the FG JR1. Lefties can find a great option in the FG720SL. Nylon-string guitars are less common but great for classical, flamenco, and bossa nova. If you intend to focus on one of those styles, go with a nylon-string. The strings are easier on the fingers at first, there are many subtle differences in the shape of the guitar, and they’re usually plucked with fingernails instead of a pick. I don’t specialize in this area, so I can only offer a suggestion based on others’ raving reviews: the Cordoba C5. Do you want to rock? Crank that sucker up loud? Or perhaps some searing blues or jazz solos? Get yourself an electric guitar! Electric guitars don’t make much noise on their own, so you’ll also need an amplifier (amp, for short) and an instrument cable. Since they require power, electrics aren’t as portable as acoustics, but they’re far more versatile. There are plenty of knobs and settings to tweak between the guitar and the amp and a whole world of pedals you can dive into later. Electric guitars are easier on the fingers than steel-string acoustics; strings on electrics tend to be thinner with lower tension. The three most popular electric guitar models are the Fender Stratocaster, Fender Telecaster, and Gibson Les Paul. There are many guitars based on these designs, and they’re not “knockoffs,” just imitating what works best. The real thing will deliver guaranteed reliable quality but carries a bit of a premium. If you can swing it, my number one recommendation is the Fender Standard Stratocaster. It was my first guitar sixteen years ago, and it will continue to be one of the best quality instruments in my collection for years to come. For a less expensive option, some of my students have done great things on the Epiphone LP Special II. You’ll also need, at the very least, an amp and a cable. Beginner kits like this one will get you everything you need in a single purchase. If you go that route, just be aware that you’ll want to replace every piece of the package within a couple years. It’ll get you started quick, but it’s all cheap stuff. For quality, lasting gear that won’t drain your bank account, buy separately; check out the guitars above and a simple, great-sounding practice amp like the Orange Micro Crush. And here’s a 10-foot cable. I mentioned above that I recommend a 3/4-size guitar like the FG JR1 for kids under 10. That’s not a firm rule; I’ve had several 7- and 8-year-old students do just fine on full-size guitars. I would avoid 3/4-size electric guitars, as they tend to be very cheaply made and hold students back with tuning difficulties and failing electrical components. If an electric guitar must be had because it’s the most exciting, go full size even if it’s a little too big for now. For adults with small hands, you might also appreciate a 3/4-size, but you almost certainly don’t need it. See this article for some inspiration: Your Fingers Are Just Fine. The guitar world is dominated by right-handed gear. There are options for lefties, you just have to dig a little more. I’m right-handed, so I don’t have personal experience here, but I’ve known some left-handed people to play right-handed and some to play left-handed. A good litmus test is to check how you play air guitar to your favorite guitar songs. Are you strumming with your left hand? Go with a left-handed guitar. I’ve been linking my recommendations in this article to Amazon. I’ve been happy with several instruments I’ve bought from Amazon, but your best option is to take a guitar-playing friend with you to a local music shop. Avoid Guitar Center if you can; the selection’s great, but the customer service is often lacking. (I send my Seattle students to The Trading Musician at Roosevelt and Ravenna.) If you don’t have a guitar-playing friend, try making friends with one of the staff. Visit several shops if necessary. Now have your friend shop for you. Communicate your interests and price constraints, and have them try out a bunch of different guitars. They’ll judge how it feels to play it (whether it might hold you back), and you’ll judge the look and sound (whether it excites you). Once you’ve got your first dream guitar (and amp if you’re electric), you’re still not quite done spending that cash. There’s a whole pile of accessories you could buy, like picks and tuners and slides and footstools, but I’ve separated the essentials from the nice-to-haves in my Recommended Guitar Accessories list. Now, it would be nice if guitars were always sold in guaranteed playing condition, like cars, but they’re a little more like suits. A suit usually needs to be tailored after you buy it, especially a nice one, but even a cheap one will look better on you after some alterations. Guitars are the same way, but the tailoring is called a setup. A setup entails lots of inspections and adjustments, such as neck straightness, string height, and intonation. It will make the guitar play like it’s supposed to. Why doesn’t it already play like it’s supposed to? Guitars are delicate things, and they’re made of wood, which gets manipulated by changing temperature, pressure, and humidity. And the most affordable guitars don’t pass through a lot of rigorous inspection, so it’s always a good idea to have a professional tweak it into shape. If you’re buying from a local shop, ask them if a setup is included. Probably not, but they might offer a discount if they have in-house repair technicians. Your ideal first guitar inspires you to play and won’t fight you while you’re learning. Beware of cheap junkers! Want to get loud, rock out, and play solos? Love fiddling with knobs and switches to unleash crazy sounds? Go electric. Everyone else go acoustic! Probably steel-string.